Dreamworks’ How to Train Your Dragon was an example of setting your expectations low and coming out pleasantly surprised. The first film proved that the studio could create animated masterpieces and it left audiences across the globe hooked. However, expectation has never been higher for its sequel, How to Train Your Dragon 2, but does it soar to the dizzying heights of its predecessor? Thankfully the answer is a resounding yes. From beautiful animated dragons to breathtaking aerial-bound sequences, this sequel just about surpasses the original in every way. 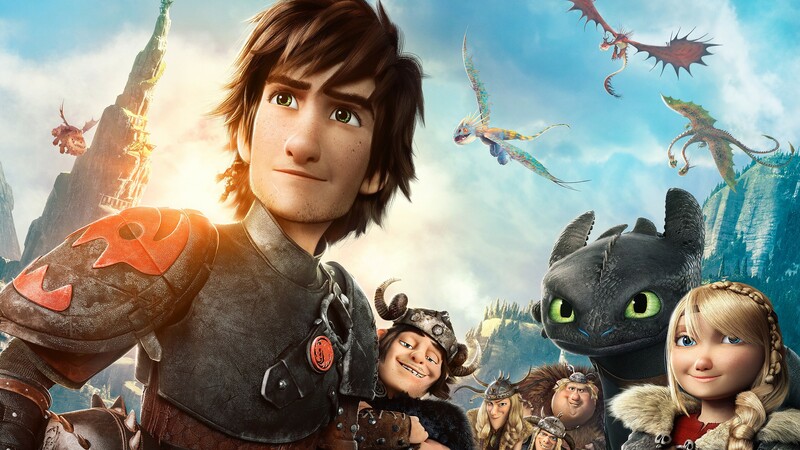 Following on five years after events in the first film, Dragon 2 follows a 20-year-old Hiccup, voiced wonderfully by Jay Baruchel, and his sidekick Toothless in their home town of Berk as the residents come to terms with living peacefully alongside dragons. Being Hiccup, he is naturally curious to learn about a legendary ‘dragon master’ who can enslave the beasts to form an army and sets out to persuade him to care for the animals like the villagers. This plot point is sidetracked from the outset however as we are introduced to Valka – Hiccup’s long lost mother, voiced by a rather miscast Cate Blanchett. The bond between Hiccup and Toothless has grown massively in the five year break between films and this makes them even more enjoyable to watch. Yes, each of the villagers has their own dragon to look after, but it is the relationship between the two primary characters which we really care about the most. Feline similarities in Toothless will not go unnoticed, his cat-like qualities give him an air of cuteness that you wouldn’t expect to come from such a menacing and ultimately deadly creature, and it is testament to Dreamworks that they have managed to craft such a personality for a character that never speaks. The animation is also absolutely stunning, from the crystal waters of the sea around Berk to the people and dragons themselves, everything has been given an upgrade after the first film’s success and the battle scenes are beautiful in their simplicity – there’s no worrying about losing track of characters here. However, it’s not all smoke and mirrors, the story has real meaning. Family values are explored, the way to treat animals is also looked at briefly and ultimately, this is about one young man’s journey to maturity. Unfortunately, the vocal performance of Cate Blanchett detracts somewhat from the overall magic. Her peculiar Scottish accent, which travels all over Europe by the time the end credits roll, is of particular annoyance and it’s a better film when she is not playing a central part. This is a shame as the realisation that Hiccup’s mother isn’t dead should be one of great consequence, but Blanchett’s strange acting hampers the scenes. How to Train Your Dragon is to Dreamworks what WALL-E is to Pixar, each film is one of, if not the best animated feature from either studio and Dragon 2 follows that trend. It is the rare sequel that is superior to the first film – a la Spider-Man 2. It’s an emotional rollercoaster too, and in some places very dark, possibly too much for children, but for teenagers and adults alike, there is something to enjoy here. From the engaging plot to the mesmerising soundtrack. Overall, How to Train Your Dragon 2 is a fine film, helped along the way by some incredible animation, amazingly deep characters and a meaningful story. Only a poor showing by Cate Blanchett stops it achieving perfection. Overall: Watch out Pixar, there’s a new kid on the block. I definitely agree with your review. It is a great movie. Probably the first time I find a sequel better than the original movie. “How To Train A Dragon is to Dreamworks what Wall-E is to Pixar.” I couldn’t agree more! Thanks for your comment Kate and I’m glad you agree with my review. Thanks for your comment Katie, and i’m glad you agreed with my review.